EnvokeIT | The IT Melting Pot! This is something that we at EnvokeIT have been trying out for quite a while and really enjoy, it’s a great service that will simplify a lot for many service providers and customers. Contact us at EnvokeIT if you have any questions or if you need assistance on your journey to the cloud! Now your business can take advantage of Citrix Workspace Cloud, the fastest and easiest way for IT to enable business productivity with secure apps, data, device management and more. I’m pleased to announce the general availability of Citrix Workspace Cloud, the industry’s simplest way to build and deliver a complete workspace without compromise. Now, you can easily combine virtual apps and desktops, mobile apps and device policies and data – securely delivered from any cloud or infrastructure you choose – whether on-premises, off-premises or both in a hybrid model. 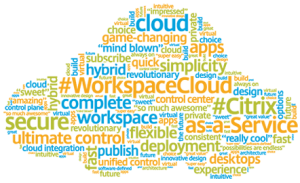 Over the past 18 months, the team has been busy engaging with customers, partners, industry analysts, media, Citrix Technology Professionals, ISVs and alliance partners around the world as we built Workspace Cloud. The general reaction has been consistent: Workspace Cloud is unlike anything else and comprehensively addresses the biggest challenges in workspace management. The cloud-based management and control plane accelerates deployments. The choice of infrastructure locations provides the flexibility partners and customer’s demand, and the comprehensive set of workspace services that are always up to date ensure you can meet the broad set of IT use cases. Want to run your contractor applications out of Amazon, your productivity apps in Azure to be near their Office 365 data, and desktops on-premises? No problem. Workspace Cloud provides the only solution that allows you to select the best infrastructure combinations based on economics, performance, existing capacity, sovereignty, and expertise. This means the selection can be made on a per-service basis. This choice extends not only to your applications and desktops, but also to your data. Workspace Cloud accelerates deployment and management through a SaaS-based control plane and securely communicates with your infrastructure through a simple cloud connector. Driven by a simple stateless, zero-touch management architecture. After a simple installation the connector is ready to provision resources, enumerate users from Microsoft Active Directory domains, and launch session requests. Workspace Cloud subscriptions contains services that address the core use cases customers face every day and are available today. Start with one offering but easily add more based upon your expanding business needs. Applications and Desktops Service – Deliver secure virtual apps and desktops to any device, and leave the product installation, setup, configuration, upgrades and monitoring to Citrix based on industry-leading XenApp and XenDesktop technology. Mobility Service – Provide cloud-based, comprehensive enterprise mobility management (EMM) — including mobile device management (MDM), mobile application management, and enterprise-grade productivity apps — for a secure user experience on BYOD or corporate devices based on XenMobile technology. Then you might be the one that we’re looking for!! Are you currently working within the mobility area or with any of the major Mobile Device Management products out there (MDM, MAM, MIM etc.)? Then we’d love to talk to you! We strongly believe in this area and are focusing on it and would like to have you onboard on this journey! And of course we’re focusing on the Citrix product portfolio but are mainly looking for people with experience within the area and not exclusively on the Citrix XenMobile/Zenprise products. And Enterprise Mobility Management is here to stay, it’s the future work-/play-ground! Wow, this is an area that is exploding! And I must agree that I’m not the expert within this area, but there are so many new capabilities being developed right now and we and our customers see the business value here. We’re talking about everything from traditional old school SSL VPN to supporting the latest mobility, application and cloud delivery solutions out there! So if you have experience on the Citrix NetScaler product or are a current Cisco, F5 or Riverbed person; contact us to hear more on what we have to offer! It’s exciting! EnvokeIT continues to expand and we are looking for new colleagues within the Mobility, Networking and Virtualization areas. It doesn’t matter if you currently are a Junior or Senior consultant! It doesn’t matter, just as long as you have the will to grow! Come join us on our exciting journey! We are looking for someone who wants to grow with us! EnvokeIT are confident that our employees are our most important assets. Employees who are happy and like to go to work makes a difference. Our continued success is based on finding, retaining and developing talents that understands customers’ business processes and future IT needs. As a consultant with EnvokeIT you are employed by us but you work with one of our clients. Assignments can be for longer or shorter periods depending on what you are working with, what customers need and your personal preferences. You build on your resume with new experiences and skills, while contributing to customer business activities with your knowledge and skills. We want to be one of the best and most exciting employers in the IT industry. As an employee of EnvokeIT you are given a unique opportunity to participate in the company’s further development. Periodically, you will be invited to consultant meetings where you get the chance to meet your peers that are working on various assignments on EnvokeITs behalf. Sometimes we organize lectures that will be a part..
Continue reading and apply here!